Webster faculty and a U.N. rep moderated the discussion among students and faculty. The debate gave all students and faculty an opportunity to ask questions and express their feelings and perceptions on the result, to clarify how the U.S. electoral system works, and discuss what changes on the world stage are expected. Participants mentioned the importance of the loss of jobs in certain key states, the voice of disgruntled, white, lower middle-class voters, and the attitudes of liberals toward the Republican electorate as factors in the result. While the attendees leaned toward Hillary Clinton, one student asked if a victory by the Democrat would have created similar indignation among those outside the United States, given attitudes toward U.S. policy and impact. The discussion was moderated by Webster faculty members Oreste Foppiani and Jubin Goodarzi of the Department of International Relations, Geneva campus director Clementina Acedo, and Meg Riggs, deputy public affairs counselor of the U.S. Mission to the United Nations in Geneva. 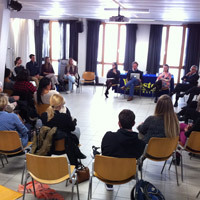 Read more about the event at Webster Geneva.